In medium bowl, mix egg product, cheese and onion powder; set aside. In 10-inch skillet, melt butter over medium heat. Add broccoli, carrot, bell pepper and olives; cook 3 to 5 minutes, stirring frequently, until vegetables are crisp-tender. Pour egg mixture over vegetables; reduce heat to low. Cook, stirring occasionally from outside edge to center, allowing uncooked egg mixture to flow to bottom of skillet, until center is set but still moist. 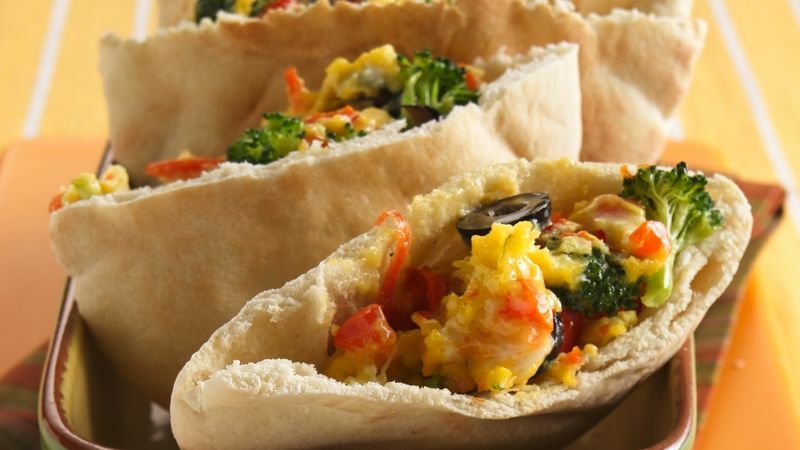 Spoon egg mixture evenly into pita bread halves. The veggies add lots of crunch and lots of vitamins and minerals to this easy, colorful dinner. Use your family's favorites or any veggies on hand.